To most people, inflation seems quite mysterious. This is not without good reason. First of all, it’s an abstract concept. Inflation is not when the price of some things go up. Just because the price of gasoline or wheat increases doesn’t mean inflation is happening. Inflation is when the price of everything, on average, goes up. This concept isn’t just abstract, it’s almost impossible to measure over the short run. Inflation isn’t usually obvious until it’s really climbing. Another reason inflation seems so mysterious is because so many misunderstand when it is or isn’t happening. Politicians and economists are notorious for saying inflation isn’t happening when it is, and saying inflation is happening when it isn’t. Anyone paying attention would think inflation is completely inexplicable. It’s not. Inflation is simply when the money supply increases faster than production of goods and services. That doesn’t mean it’s easy to measure, but we do know what it is. Inflation is also terribly destructive. As Keynes said, it is a very easy way for governments to confiscate tremendous amounts of wealth without the populous seeming to notice. That is, until inflation gets very high. Then it rips an economy and government apart (starting with the poorest, I might add). A quick look at history will reveal that few governments collapse because they have bad policies or default on debt, per se. The thing that will destroy a country more easily than anything (besides war) is inflation. The record is quite clear. The path to inflation is also easily understood. Many writers have described the process accurately, usually after an exhaustive study of history. Peter Bernholz perhaps describes it best in Monetary Regimes and Inflation: History, Economic and Political Relationships. To start, you have a government conservatively financed with low taxes and limited power. As the government extends its power over time, it gets to the point where it cannot raise taxes enough to further grow its power (people eventually refuse to pay the higher taxes either direct protest, or indirectly by violating the law). At that point, a government starts to borrow. The borrowing starts low and gets higher as time progresses. At a certain point, the borrowing becomes high enough that those lending to the government demand higher interest rates. That’s when things start to come apart, and that’s when the government starts creating money much faster than economic growth. And, that’s when inflation goes ballistic and things finally come apart. This path is not followed precisely each time, but that’s generally the path to high inflation. For example, some governments realize they are creating money too quickly and reign things in. This is possible not solely because the people or government decide to be more rational, but because the size of government debt and spending is not too large relative to the rest of the economy. It wasn’t hard for the U.S. to get inflation back under control after the Revolutionary War, Civil War, World War II, and the 1970’s (Vietnam War), because our government debt and spending weren’t yet too high relative to the productive capacity of the economy. But, it’s not necessarily the case that cooler heads can prevail if the debt is too great. The best defense against inflation is a precious metal standard, usually gold or silver (and gold has been far superior to silver, historically). The next best thing is a paper money standard with an independent central bank (independent of political authorities–particularly elected officials). Unfortunately, this “next best thing” has always and everywhere been an intermediate step on the way to high inflation, usually by way of making the central bank beholden to elected officials. I mention this because Barney Frank, a Congressman more responsible for the housing crisis than Wall Street and all the banks in the U.S. put together, is currently suggesting we make our central bank, the Federal Reserve, beholden to elected officials. Like F.D. Roosevelt tried to stack the Supreme Court to force his policies through, Barney Frank wants to make the Federal Reserve more directly swayed by the Congress. Now, I’d like to step back to put my above comment into context. The U.S. government has gone from being conservatively financed (we’ve had an income tax for less than half our history), to grabbing more and more power (economically, militarily, socially, etc.). That power has been expensive, so much so that we had to start issuing larger and larger amounts of debt to finance that growth in power. 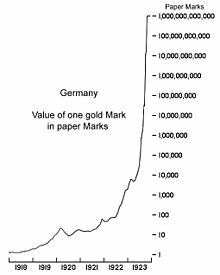 As that occurred, the U.S. went off its domestic gold standard in 1933 and off the international gold standard in 1971. Since then, we’ve had higher and lower inflation (to the degree our independent central bank kept things in check–almost always against the will of politicians!). With the growth of our welfare state, particularly in the form of Social Security and Medicare, our government has racked up tremendous financial obligations, far out-weighing our military spending or any other spending (including those dreadful bank bailouts). Governments get into trouble when debt grows to exceed 90% of the economy. That’s when the economy slows because of the debt millstone around its neck. We’re either there, now, or very close. We also know that governments get into trouble when the deficit of spending versus tax revenues grows to over 20% of spending. We’re around 30% now. So, as our government has grown in power, it has gotten into so much debt that it is close to preventing the economy from growing its way out of the problem. And, it has abandoned the best thing to prevent high inflation–a precious metal standard. Added to this, there are elected officials who would like to remove our last line of defense–the independence of our central bank. High inflation doesn’t have to happen here, but we are getting farther and farther out on a limb that can lead us to tumble off into serious trouble. We can decide to turn around and scramble back toward the tree. That would require us to keep our central bank independent at a minimum, and then get back on a precious metal standard. It will also require us to reign in our government’s size relative to our economy (that means spending cuts and the restructuring of our tax system). The inflation path is clear, and we keep taking steps down it. Perhaps it’s time to turn around. Great article by Jonathan Weil last week from Bloomberg. If investors had listened to the speculators, who were incentivized by the profit-motive, they would have avoided Dexia. If investors listened to the government’s appraisal, they were led to the slaughter. Look at Barney Frank and Fannie Mae, or the SEC and Bernie Madoff, or Ben Bernanke and the housing market. The list goes on and on and on. The short-selling speculators have a huge incentive to get their analysis right. And, in general, they do. Look at government officials and their record in uncovering malfeasance. It’s terrible. So why do people run in fear from the “bad guys” who almost always get it right, and run to the arms of the government officials who almost always get it wrong? Beats me. But, they get what they deserve. Bad Bank! Now, go to your room! As an occasional investor in banks (I currently own Wells Fargo and would like to buy US Bancorp, M&T and Park National), I have to admit to being somewhat surprised at all the bad press banks have faced recently. As usual, it seems to be a perception versus reality issue, but I believe there is a willful ignorance on the part of both the press and the general public. I suppose I should elaborate before the hate-mail gets sent. First off, not all banks are the same. Just as you shouldn’t judge a person by their skin or gender, you shouldn’t rush to judge an organization simply because it belongs to a particular group. There are good banks and bad banks, just like there are good and bad people. Several investment banks, like Bear Stearns and Lehman Brothers, were gambling with tax-payer dollars, and they deserved to go bankrupt. Their shareholders and bondholders should have reaped what they sowed, though, and taxpayers need not have been involved. Nor should bankers have been allowed to gamble with tax-payer dollars. I don’t blame a 3-year-old for asking for a full-sugar and caffeine soda 5 minutes before bed; I do, however, blame their parents for giving in. So it is with banks. I expect a very small minority of bankers will be vicious (that must be accepted in any society), but the real fault lies with a government that supported and encouraged that vice, not with all bankers as a group. Also, just because a bank has been “bailed out” doesn’t mean they are bad, either. Keep in mind the U.S. Treasury and Federal Reserve didn’t give many banks a choice on taking a “bail-out,” and most of those good banks didn’t need or want it. Once again, this reasoning is like blaming someone raped or mugged for “giving in” instead of blaming the real perpetrator. Just because some people are ignorant of these facts does not forgive their avowed but poorly informed conclusions. Second, a lot of what banks have been blamed for recently is the result of well-meaning politicians that are clueless to the point of being vicious. Let’s take the recent furor over Bank of America charging $5 per month for debit cards. A bunch of politicians have decided, in their infinite wisdom, that banks are charging too much for interchange fees. Instead of letting customers, banks, networks, merchant acquirers, and merchants decide what’s fair, the Federal Reserve is now inserting itself in the process of free interaction to dictate what fees the participants can charge each other. What is the rational response of an organization that has bondholders, shareholders, employees and more-mathematically-inclined customers to take care of? Raise the same amount of money elsewhere in the form of additional fees! Why should some bondholder have to eat that overdraft fee or lost revenue from interchange? Why should the shareholder, or employee, or customer? They shouldn’t! No rational person expects one bus-driver to take a pay cut to support another bus-driver who is too lazy to know how much money they have in their account. Nor do most people think that politicians should arbitrarily cut a bus driver’s pay because some passengers don’t feel like paying that much. So, why would it be any different for banks? Banks are now quite logically raising additional fees and turning away customers it used to accept. In addition, fewer customers are getting credit and debit cards, fewer merchants can afford to accept the cards, and services that were once free–like checking accounts–now frequently require fees. This is all quite logical and predictable, even to narrow-minded politicians who wish they could have their cake and eat it, too. The only surprising thing is that they thought their laws would have no unintended impact! Third, politicians are crying for banks to lend more money while–at the same time–raising their capital requirements (if banks lent more money, all else equal, they would violate the old capital requirements–let alone meet the new ones). Politicians are also saying banks aren’t being generous enough in offering credit to those who need it while–at the same time–bemoaning the fact that banks have so much bad debt on their books. The blatant contradictions in both of these views should be obvious to anyone with knowledge of banking, but that apparently isn’t required for politicians who regulate banks. We don’t need to send banks to their room for being bad. We need to unshackle them so they can do their jobs. I’ve read that banks now need 1.2 employees to keep up with regulatory requirements for each employee taking deposits and making loans. Perhaps if banks weren’t so busy meeting all these new and old regulatory hurdles, they wouldn’t be gambling with taxpayer dollars, charging high interchange and overdraft fees, and they’d be making more loans, offering more services and getting the economy going again. That doesn’t seem very likely, though, given all the shrieking from the press, public and politicians about how bad banks are. 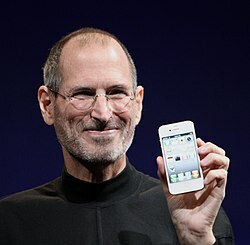 Steve Jobs was a hero of mine, and the world will truly miss him. My parents bought my first computer, an Apple IIe, for me in the early 1980’s. I learned to do computer programming with it and spent countless hours playing games. I also used it to get through high school–writing papers, doing science projects, etc. I’m an avowed computer geek and have loved using a computer to make things happen ever since. Steve Jobs was the indomitable spirit who brought that productive and enjoyable experience to me. He was a hero because he had overcome great odds to create a huge, profitable and productive industry: personal computers. That alone would have put him in the business hall of fame. But, that wasn’t enough for Jobs. Jobs was ousted from the company and industry he had created in 1985. That failure was the fertilizer from which he re-invented himself and then several industries. Jobs struggled with his company, NeXT Computer, from 1985 until it was bought by Apple in 1997. Not unusually for Jobs, he was ahead of the industry with NeXT. Also during that time, he bought The Graphics Group from Lucasfilm and turned it into Pixar, which was bought by Disney in 2006. Behind the scenes, he was laying the groundwork to transform the entertainment, consumer electronics, telecommunications and computer industries. Pixar changed movie making forever. Even the Disney powerhouse couldn’t compete and had to buy him out to maintain its competitive position. Jobs ended up Disney’s largest shareholder while dramatically changing the visual content creation industry. After returning to Apple, Jobs cleaned the company up. He pruned unsuccessful business lines and refocused the company on its roots: user-friendly software. His NeXT operating system evolved into Mac OS X. He launched iTunes to make user-friendly software the gateway to digital content. He launched the iMac to integrate his software into hardware that exploited its benefits. He launched the iPod to exploit the benefits of iTunes. He launched the iPod Touch to exploit and perfect the multi-touch user interface. He launched the iPhone to bring multi-touch and user-friendly software to the phone business. He used his iTunes platform to distribute applications (apps) to the iPod Touch and iPhone. The iPod Touch and iPhone then came together in the iPad–seen as a replacement for using a PC for content consumption. iTunes now seems to be transforming into iCloud, which will broaden and deepen Apple’s digital content distribution. Jobs transformed more industries than anyone before, and perhaps ever after. He was a creative light, a genius with technology, a perfectionist with standards few could match, a visionary, a brilliant pitchman, and wonderfully successful and rich. He deserved all he earned, both in reputation and money, and left us with more than we could ever repay him. With his life over at 56, people will forever wonder what he could have done if he’d lived longer. What else could he have come up with? What other industries could he have remade? Unfortunately for us and him, we’ll never know. Perhaps one of his greatest triumphs is seldom mentioned. I’ll call it the Wal-Mart effect. When Wal-Mart comes to town, it lowers the prices of goods for all consumers in the area, even those who don’t shop at Wal-Mart. Jobs did the same thing in his industries. Every brilliant idea Jobs had was mimicked by others. Windows took 10 years to catch up to Macintosh, but tons of people who never touched a Mac benefited. Jobs raised the game of competitors in all the industries he touched: music distribution & usage (where he protected the rights of artists), mobile telephony, computers and computer software, gaming, etc. The Jobs effect is as likely to be missed as Jobs’ own products. Jobs has been a hero of mine since I was a pre-teen, and he’ll be a hero forevermore. Thanks, Mr. Jobs.